Gern weise ich auf das Buch "Sexes of Winds and Packs. 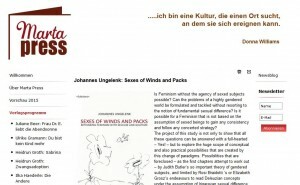 Rethinking Feminism with Deleuze and Guattari" von Johannes Ungelenk hin, in dem er die Konzepte von Judith Butler und Luce Irigaray diskutiert und mit Begriffen von Gilles Deleuze und Félix Guattari eine queer-feministische Alternative ausarbeitet. Das ist ein interessantes - und geglücktes - Unterfangen. Erschienen ist das Buch im schönen, feministischen und queeren Verlag Marta Press: http://www.marta-press.de . # Ein Rezensionsexemplar kann direkt bei Johannes Ungelenk bestellt werden: johannes.ungelenk@googlemail.com . Is Feminism without the agency of sexed subjects possible? Can the problems of a highly gendered world be formulated and tackled without resorting to the notion of fundamental sexual difference? Is it possible for a Feminism that is not based on the assumption of sexed beings to gain any consistency and follow any concerted strategy? The project of this study is not only to show that all these questions can be answered with a full-hearted – Yes! – but to explore the huge scope of conceptual and also practical possibilities that are created by this change of paradigms. 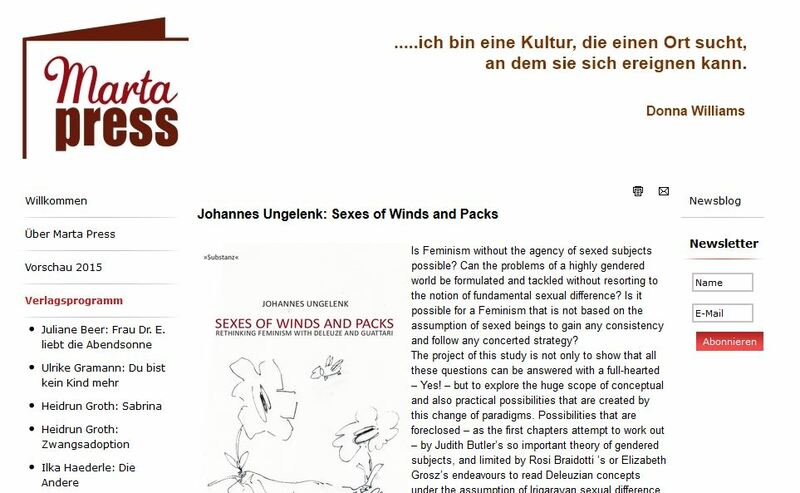 Possibilities that are foreclosed – as the first chapters attempt to work out – by Judith Butler’s so important theory of gendered subjects, and limited by Rosi Braidotti’s or Elizabeth Grosz’s endeavours to read Deleuzian concepts under the assumption of Irigarayan sexual difference. Gilles Deleuze’s and Félix Guattari’s thinking provides us with conceptual tools for a thorough analysis of the status quo – and means for conceptualising resistance that do not perpetuate the power structures it is fighting against. This book is an invitation to get in touch with these tools, join the alliance (no matter whether ‘queer’ or ‘feminist’) – and ‘Make Rhizomes’!